From its natural ingredients to its carbon-neutral operations and its eco-friendly packaging, you’re going to want to lather up with Lather. First spied by Inhabitat at this year’s Indie Beauty Expo, Lather’s long line of sustainable skincare products have made themselves a new home in our medicine cabinets. Founded in 1999, Lather was started by Emilie Hoyt after she battled with migraines — which were partially caused by the harmful ingredients found in conventional skincare and cosmetics. Hoyt is an “explorer at heart” with a deep appreciation for nature, so she drew upon this passion when creating a wellness brand that emphasizes natural ingredients while also keeping the planet in mind at every stage of production. In addition to using ingredients straight from nature, Lather does not test on animals, nor does it work with manufacturers that do. Furthering its commitment to sustainability, Lather is a carbon-neutral company that uses EcoPure, recycled materials and soy-based inks in all of its packaging. It’s hard to narrow down the products to our favorites, but we must say that the bamboo lemongrass body scrub is one of the most popular Lather products for good reason. The scrub has become an essential part of our showering routine — the scrub suds up to cleanse you while also gently exfoliating skin and emitting a really pleasant, natural fragrance. Follow this up with the matching body lotion for a refreshing scent that invigorates you and a moisturizer that leaves your freshly exfoliated skin at its softest. Along the lines of keeping your skin happy and hydrated, we recommend keeping Lather’s Hand Therapy with you at all times. This restorative lotion is made with shea, oats and olive. The scent is earthy in a pleasant way, and the cream helps relieve cracked hands and dry cuticles. Lather also offers a multitude of face cleansers that target various skin concerns, from dryness to oily textures and sensitivity to blemishes. There are also different formulas, such as gels, creams, oils, and soap bars. We tested the Ultra Mild Face Wash. It’s a powerful cleanser that removes makeup with ease without leaving skin feeling dry or tight. We weren’t in love with the smell, but we didn’t hate it, either. We followed this face wash with the Ultra Light Face Lotion, which doesn’t have much of a scent to it. It was perfect for a daily moisturizer — hydrating enough to banish dryness, but light enough to wear all day without feeling heavy or greasy. Overall wellness is a prime factor behind all of Lather’s products, which is why the company developed a gel based pain reliever for muscle aches and pain. The gel provides temporary pain relief with formulated herbal extracts used by the native tribes of Northern Mexico. The gel is incredibly fast acting once its massaged onto joints or muscles and has a lingering cooling and heating effect that is felt almost instantly thanks to the menthol, camphor and capsaicin in the product. While the scent is powerful, it’s not overbearing and definitely worth it as this gel can quickly alleviate pain. We have made this our go-to pain relieving gel. While Lather is designed to enjoy at home as its own act of self care, the company’s passion for wellness extends in-store, too. From free Pamper Parties for groups to indulge in an afternoon of natural skincare to relaxation stations with cozy seating and “5-minute stories” from a machine that offers short stories for guests to read, Lather encourages clients to take a moment to breathe and enjoy each passing moment. The brand’s ethos to care about yourself and the environment is evident through and through. Editor’s Note: This product review is not sponsored by Lather. All opinions on the products and company are the author’s own. Lather's booth at the Indie Beauty Expo in Los Angeles. Lather offers a variety of restorative lotions. 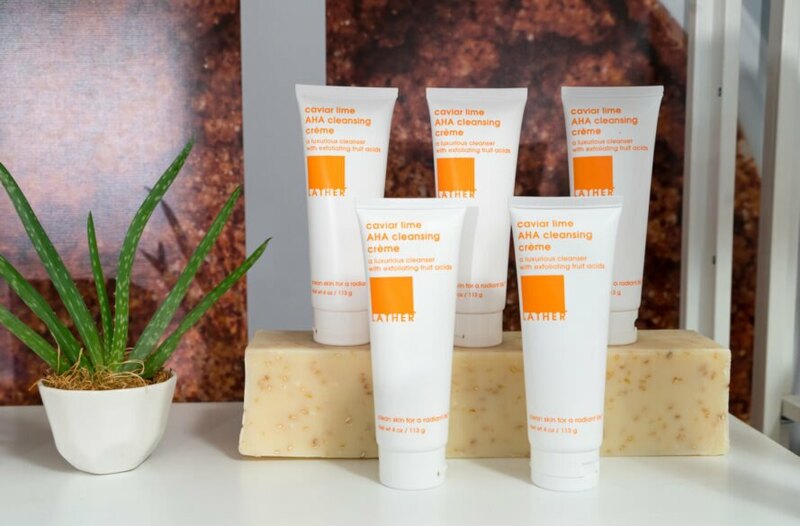 From face washes to body scrubs and pain relieving gels, Lather is a one-stop-shop. 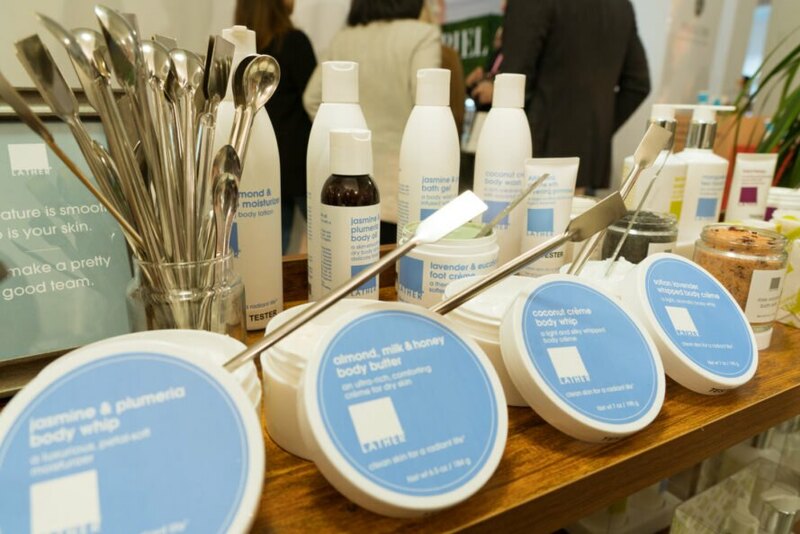 Lather deeply commits to having eco-friendly ingredients and packaging. 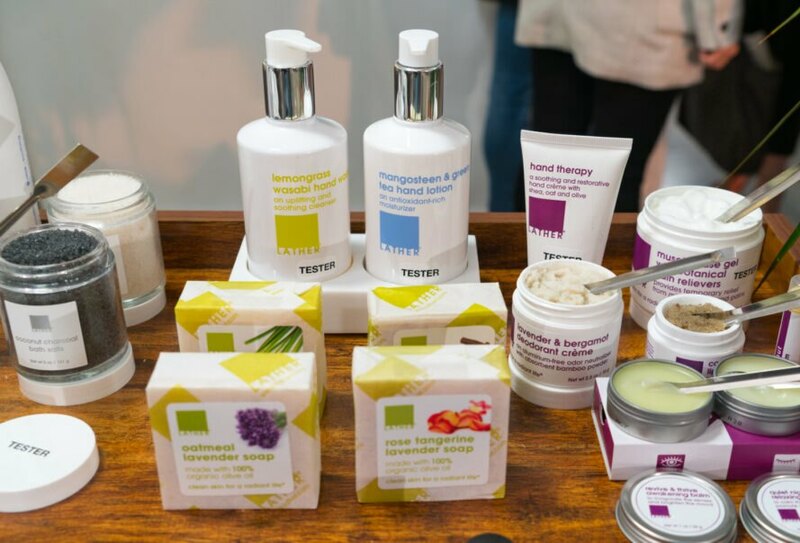 Founded in 1999 by Emilie Hoyt, Lather is known for its eco-friendly products.